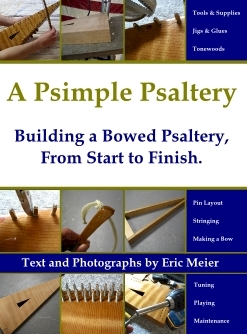 When making a bowed psaltery for the first time, one of the most tedious tasks is laying out and measuring all the pins. Thankfully, there is an easy way to do this: with a jig. Basically, I took a 1/2″ piece of plywood, cut it to the size of the psaltery, and inserted sharp self-piercing sheet metal screws where all of the tuning pins should go. 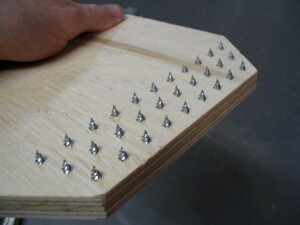 It takes some extra time to make this jig, but once it is finished, it greatly accelerates the pin layout process. Since the screws I used were 5/8″ long (in 1/2″ plywood), this leaves sharp 1/8″ long points at all the exact locations of the tuning pins. All that is necessary is to carefully align the jig on top of the psaltery, and lightly tap on the jig with a mallet.Viola! 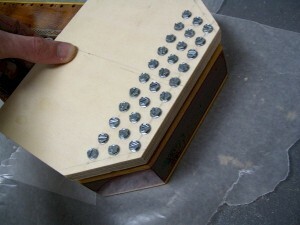 30 pin locations are instantly and perfectly transferred to the top of the psaltery. And since it is an actual indent, and not a pencil mark, it is that much easier to align the drill bit with the dimple.